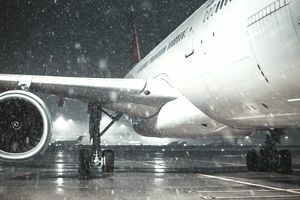 VMC and IMC are aviation terms used to describe meteorological conditions during flight. VMC stands for visual meteorological conditions, and IMC stands for instrument meteorological conditions. Although the two terms are often used interchangeably (even, sadly, among industry professionals) with the terms VFR and IFR, respectively, VMC is not the same as VFR, and IMC is not the same as IFR. As most pilots know, there are two sets of rules for flying any aircraft: VFR and IFR. VFR stands for visual flight rules, which constitute the set of regulations under which a pilot operates an aircraft in weather conditions generally clear enough to allow the pilot to see the aircraft is going. Specifically, the weather must be better than the basic VFR weather allowable in regards to the VMC, the visual meteorological conditions, as specified in the rules laid out by the most relevant aviation authority. The term IFR stands for instrument flight rules. Generally speaking, the weather dictates whether the pilot chooses VFR or IFR. For example, the prevailing visual meteorological conditions must be at least equal to what is required for visual flight rules (VFR). However, just because a flight is conducted legally under VFR conditions that does not mean that the pilot will be in VMC the entire flight. Losing visual references (and inadvertently entering IMC) can happen even while maintaining VFR flight. Also, a pilot can fly in VFR conditions while flying on an IFR flight plan, but the opposite is not true: A pilot cannot fly in IFR conditions on a VFR flight plan (at least not intentionally). Before we tackle the meaning and importance of VMC, it's worth noting that there are actually two types of VMC. For your purposes, we're going to look at the meteorological conditions and not the airspeed associated with an engine failure during multi-engine flight. This situation is denoted with a large "V" and a smaller 'mc': Vmc. The definition of VMC, according to the Federal Aviation Administration (FAA) is meteorological conditions expressed in terms of visibility, distance from cloud, and ceiling equal to or better than specified minima. Because the FAA is the national authority in regards to regulating all aspects of civil aviation in the U.S., their rules and regulations will always prevail. The definition of IMC, according to the FAA, is meteorological conditions expressed in terms of visibility, distance from clouds, and ceiling less than the minima specified for visual meteorological conditions (VMC). IMC is any meteorological condition that doesn’t qualify as visual meteorological conditions, or weather conditions worse than VMC. The terms IMC and IFR are often used interchangeably, although IMC refers to the actual weather conditions and IFR refers to the flight rules surrounding those conditions. All flights in IMC must be conducted by an instrument-rated pilot and under an IFR flight plan.